While on a family trip to Oahu, I couldn't help but wonder what it was like to really hike in Hawaii. I did some research and found out that the tallest peak on Oahu is Mount Ka'ala. 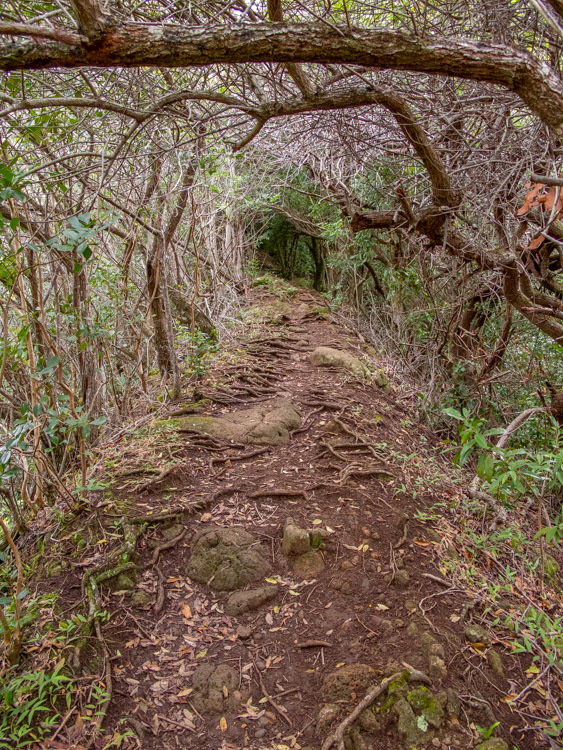 I also found out that the creators of Hawaiian hiking trails generally don't believe in switchbacks. We flew to Hawaii and had a great time at the Marriott Ko Olina Beach Resort. This morning, I woke up at 6:30AM, even though I thought I would have been up at 5:30AM. I guess my body was getting used to Hawaiian time already. I purchased four large water bottles (three for the pack and one for the car) from the market downstairs at the hotel, since I had forgotten my Camelbak bladder at home, as my daughter likes to use it as a hose to water the plants in our backyard. Also, through a comedy of errors, I left all of my printed maps and trail reports at home. Even though I didn't have the maps with me, I remembered most of the trail from memory. I decided to go against my own rule, No Maps, No Hike, just this once, since I didn't think I'd be back to Oahu any time soon. I drove the slow 25MPH crawl on the 93 to Waianae, where I took a right and drove up the valley to the trailhead. The "real" Hawaii is definitely a change from the commercialized lei-fest that most tourists know. It is rustic and rural; there are chickens and semi-feral dogs everywhere. The trailhead was next to a rustic house that I wasn’t sure was lived in, only I heard a generator start up and I could only gather that someone lived there. I quickly loaded up, making sure all my valuables were with me, since I heard that there can be break-ins in the area. It was already warm, but I still wore my Ex Officio Borocade Pant and was trying out my Ex Officio BugsAway Baja Shirt, which is long-sleeved. I was happy, however, that there was some cloud cover, but was not excited with the possibility of rain, which we had experienced nearly every day on Oahu. I was quickly met by some workers who asked me in a thick Hawaiian accent where I was going. I said, "All the way to the top." They then asked me why I was hiking alone. I pondered the question, since I was hiking a rather potentially dangerous trail by myself. I let them know that I was traveling with my family and that no one would go with me. They smiled to each other and walked away, likely amazed at the stupidity of tourists. I continued up the paved access road, almost immediately covered in sweat. It's humid in Hawaii, just in case you weren't informed. But I was comfortable, since the sun was still behind some clouds and I looked to be entering a forest soon. The Waianae Valley is a beautiful place, surrounded by jagged green ridges. I heard strange bird calls and the lowing of cows, sometimes closer than I would expect. The road ended and I started walking on the red dirt of Hawaii. The trail got a little steeper. I encountered a covered picnic table, built by a local Boy Scout and took a breather. That's when I noticed the flies and mosquitoes. They avoided me for the most part, and really left me alone while I was moving. I was thankful for the shirt. The trail continued, almost tunnel-like, along a small ridge hump. I spied a small trail leading down to the left, and made a note to try that one if this trail didn't pan out. It wasn't two minutes later when I encountered about 6 guys with 9 dogs. When I told them I was going to Mount Ka'ala, they let me know I was on the wrong trail, pointed me the right way (back down that trail to the left), and asked me if I'd seen or heard any hogs. I let them know that I hadn't heard anything yet and he let me know that I was in for an uphill battle. The trail descended to a stream and the trail forked again. I took the trail to the right, since the other trail looked like it went downhill. I encountered a small waterfall (shown in the video below), as well as some interesting plants. After I scaled the waterfall, the trail disappeared among the thick foliage and leaves on the ground. I decided to turn back and go to the fork and try the other way. I was regretting not having the maps and trip reports with me. Once I got to the other path, I knew right away that I was on the right track, since the path was well-marked and started going uphill right away. I entered a thick forest before emerging into a section where I could turn around and see the ocean in the distance. I then entered another forest where the ground was muddier and slippery. As I ascended the steep trail, occasionally losing my footing in the thick mud, I began to wonder how I was going to get down without killing myself. The trail got steeper and steeper. I was walking on roots much of the way and scrambling here and there. After every challenging stretch, I would wonder again, sometimes aloud, "How am I going to get down this?" After using some rope and electrical cable left by someone who came before me, I finally made it to the ridgeline. I stood there for a while and drank in the views and wondered what lay before me as I scouted the ridgeline that steeply spiked upward in front of me. The trail dropped off for hundreds of feet on either side of me. I made my way up, but the descent was always in the back of my mind. Even as I made it to the bog Reserve on top with the peculiar plants. 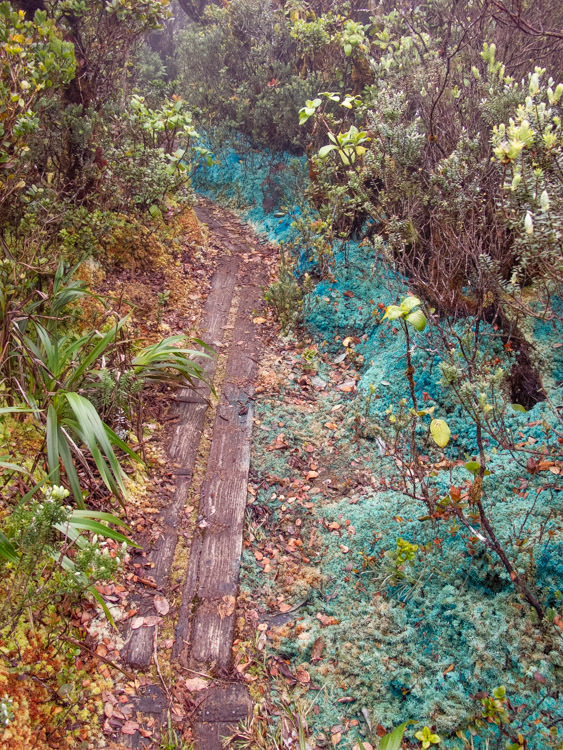 One that stood out was a bright blue iceplant-like ground cover that was prevalent near the planks that comprise the bog trail. I made it to the top and through the first fence. I entered the fence to the left of the compound and walked around to the benchmark. There was no view except into the clouds that almost aways shroud Mount Ka'ala, but it's the journey that is memorable. And boy was this an interesting one so far. I waved to some workers at the tracking station as I ate a power bar and drank some water. I longingly looked at the forbidden paved access road that follows a different way down which was completely out of the question for me. Taking a deep breath, I shouldered my pack and began the journey back down. It was a slippery, muddy excursion where I could see the drop-off on either side of the trail more clearly than when I was ascending the mountain. 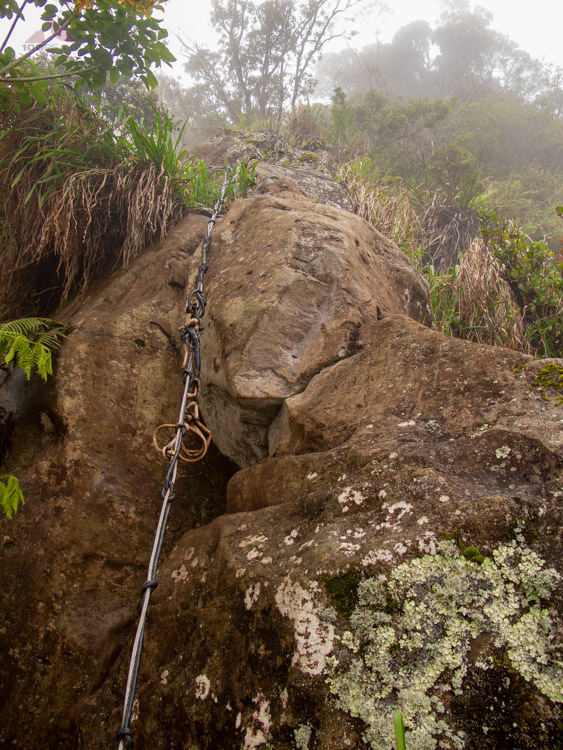 I relied on the ropes completely and perfected my rappelling technique in the first few minutes. It was actually fun in some spots until I would lose some footing and dangle over the edge for a bit. I was glad I brought my gloves and was wearing pants and a long sleeve shirt. I was completely muddy and wet when I got back to the car. I realized that I didn't take one picture or shoot a second of video on the way back. I was focused on getting back in once piece. 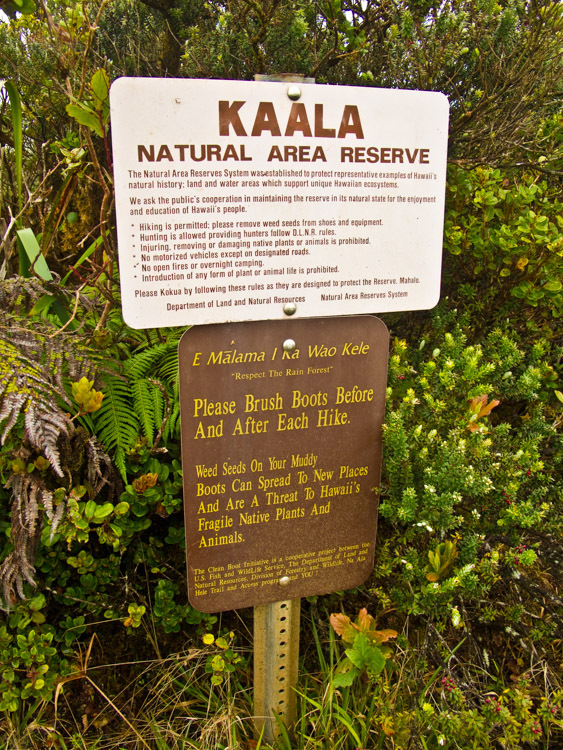 The hike to Mount Ka'ala is a hike to take with a buddy. There is some exposure and some physical and moral support would have done wonders. Don't be afraid to wear long sleeves and pants, even in warmer weather. I would undoubtedly be carrying deep scratches and more bites all over if not for that. Insect repellent-clothes work. Mine did. I only got one bite on my knuckle after seeing thousands of mosquitoes. Can't blame the shirt for that. Having a lightweight pair of gloves in your pack can leave you prepared for almost anything. It was nice to have them for the cables and ropes. Have a change of clothes in the car for after a hike. It's been a rule for me for a while now and it really feels nice when I get back to the trailhead. Have some water ready at the car, because you may be out by the time you get there. I wasn't out on this trip, but I've had water issues on previous trips and it's pretty uplifting to know you have a stash when you get to the trailhead. Hiking in the tropics is challenging and gorgeous.